I have these plants growing fast in a shady area of my property. I'm not sure if they are a ground cover or week. Can any one help me identify what it is so I know what action to take. Thanks. Here is a smaller photo for above questions. looks like maybe a mint. Are the stems square? What does it smell like when you crush a leaf? 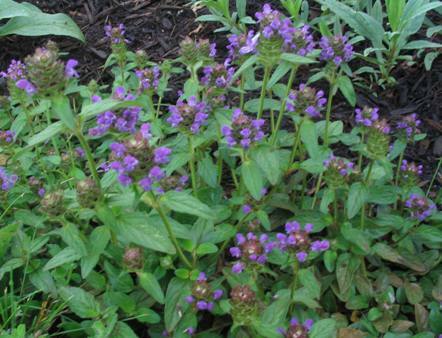 If it is a mint, you might want to dig it up and replant some in a pot/ container. Otherwise it will spread VERY aggressively and crowd other stuff out. But nice to have around! There is no mint smell. The stalks are round. Plants grow in bunches at about 12 inches in diameter and about 10 inches high. Spread fast. Don't these look like white snakeroot to you, rainbow? I've pulled so much of that, I hope I would recognize it! Its not snake root. If it was you could make some money from it. It bloomed late last year, maybe September, with shoots of small flowers, like a Lily of the Valley. Since I pull many bushels of snakeroot every year, how are you proposing to make money from it? I can't imagine anyone wanting to buy the plants, they are free for the taking everywhere. I think it's prunella, or heal-all. It definitely looks like the prunella grandiflora when it blooms. I think you got it. With that said, is it a weed, a ground cover or something else? I grow prunella as a flower. I think it's beautiful. You may not want it in the regular garden where you would have to thin it, it spreads a little. There are worse spreaders, like mint, and showy primrose, which are difficult to get shut of... due to the stolons. Prunella has very few roots, and is easy to thin out. You may find it listed as a weed, on a weed site, but... I've found tomatoes listed as a weed too. Pest identification help needed - Avocado plant.